Ford worked with Microsoft on its Sync infotainment system, but reports say the automaker will switch to BlackBerry subsidiary QNX for the next generation of Sync. The battle for the dashboard will intensify as companies fight to supply the brains and technology behind increasingly sophisticated infotainment systems. In western Europe, the market for content-rich systems using dashboard displays of 4.5 inches and more will rise to 3.0 billion euros by 2020 from 2.5 billion euros now, according to analysts IHS Automotive. The number of new cars equipped with these more expensive systems in western Europe will rise to 40 percent from 20 percent in the same time period as customers increasingly demand smartphone-like connectivity and usability, the company predicts. “We’re seeing that infotainment is becoming more and more of a selling point as people spend more time in traffic,” Jack Bergquist, IHS senior analyst for infotainment and telematics, said. One of the biggest dilemmas for automakers is deciding which underlying software platform to use. BlackBerry subsidiary QNX is the global leader with a 44 percent share of the in-dash operating systems market, according to IHS. Microsoft ranks second followed by Linux-based solutions. Ford is one of Microsoft’s biggest clients, but reports earlier this year said Ford would dump the software giant in favor of QNX for the third generation of its Sync infotainment system. Ford told Automotive News Europe that no decision had been made on which supplier would handle the project. IHS’s Bergquist said Microsoft is pulling back from automotive. “Microsoft is not bidding for new work,” he said. 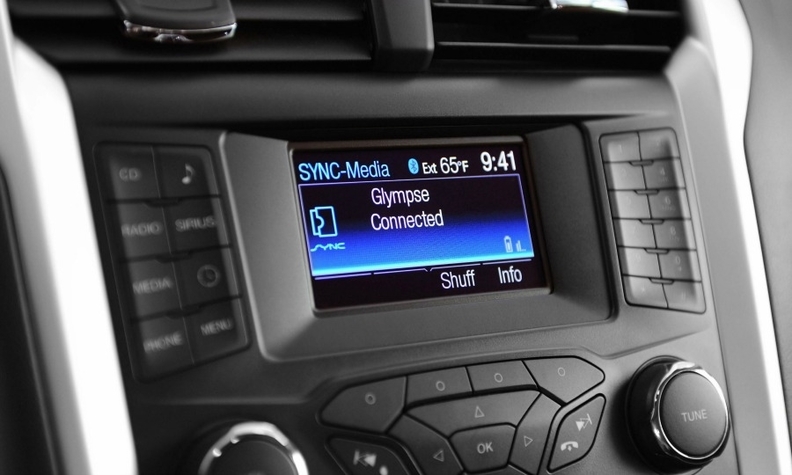 Ford did a lot of the in-house development for Sync, which is extremely expensive, according to the head of automotive at infotainment specialist Harman, a major user of QNX and also its former owner. “Today’s systems cost over $100 million, and we don’t start from scratch. For someone like Ford it costs a lot more, as well as causing untold misery and pain,” Sachin Lawande said. 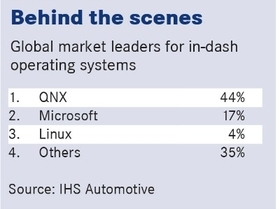 Despite its market leadership, QNX is unlikely to be the main beneficiary if Microsoft does move away from the sector, particularly among Western carmakers, IHS believes. Instead the consultancy expects that more carmakers will opt for Linux-based systems because they are open source, meaning they are license-free, and once programed to automotive grade they can be updated easily. One of the more high-profile Linux applications is Genivi, a system developed by a non-profit alliance that includes BMW and Jaguar Land Rover. Genivi is underpinned by U.S.-based chipmaker Intel. “The automotive industry needs open platforms not tied to specific vendors, and that is the major target of Genivi,” JLR head of engineering Wolfgang Ziebart said. The platform is “about to launch in our top new infotainment system,” he said, without giving a timeframe. QNX head of sales and marketing Derek Kuhn, however, is critical of Genivi. “Genivi is a marketing stunt. It’s unbelievably expensive compared with everything else out there,” he told Automotive News Europe. He also said that Linux systems could be vulnerable to security flaws. Right now automakers don’t have to safety-certify infotainment systems in the way they do for instrument clusters, but that might change as they look to integrate driver information, safety systems and entertainment. The goal is cost-saving, said Harmann’s Lawinde. “The kind of resources you have to put in are becoming very similar,” he said, referring to central processor units (CPUs), memory, power supply and controller area network (CAN) interfaces. As the automotive-grade chips from the likes of Intel and newcomers such as Qualcomm containing these CPUs get more powerful, combining all the processing in one makes sense for energy saving too.